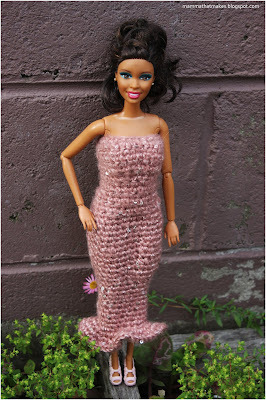 Good morning all and welcome to another Barbie gown! Today's gown is super elegant, and very glitzy. Helped in part by this fantastic Moda Vera Lillium yarn, which has tiny little sequins in it. So pretty! I've actually been sitting on this yarn for a while waiting for the right project, and this was absolutely it. 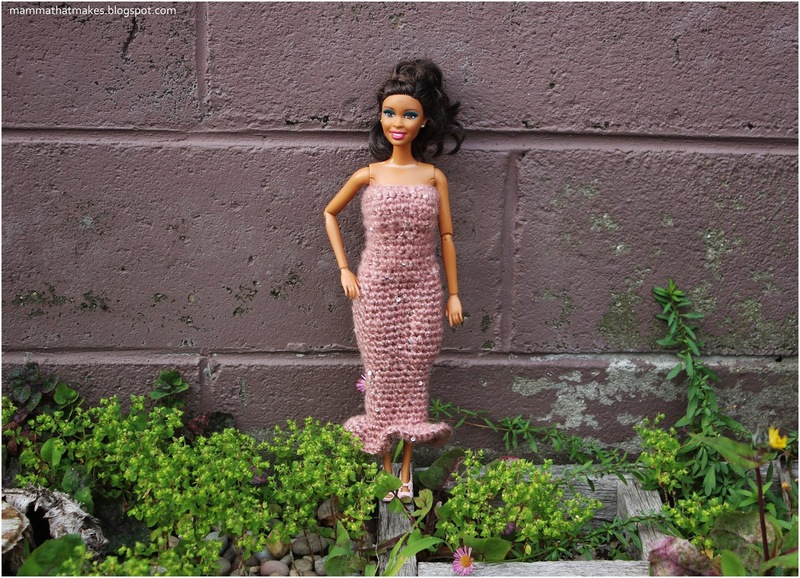 This fishtail gown is a quick afternoon project, and an excellent scrap buster too! 42: Sc in each stitch around. Add closure of choice and you're finished! Good morning all, and hello to July! 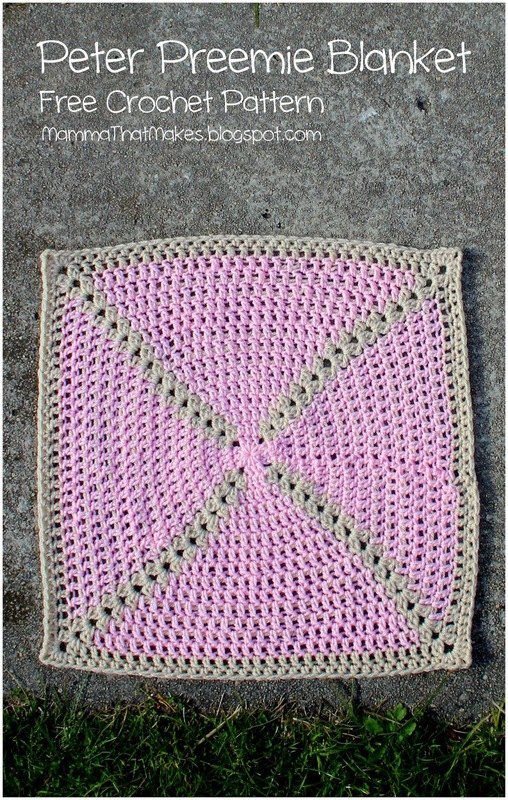 It's really starting to cool down now here in Tasmania, which is perfect for making blankets! 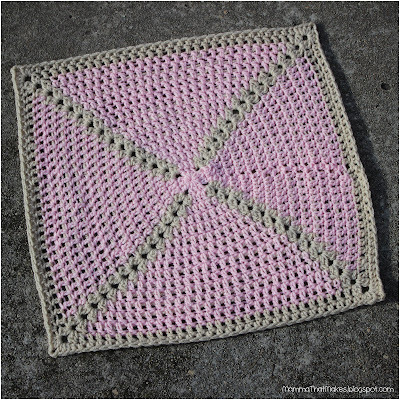 Today I have a pattern, that ties in with some others I've released this year. The Peter Gown and the Peter Beanie both feature a sweet cluster stitch, and this blanket does too. All 3 together make for a great coordinating set. I know you guys have been asking for matching pieces for a long time now, and I am so excited to have this one ready for you all. I have many more to come too! Just a heads up, when making this blanket, I carried the contrasting yarn on the back as I worked, making sure to stitch over it (instead of droping it and picking it back up). 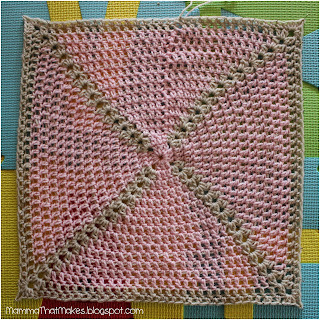 This creates a really neat effect, but you need to be VERY careful that you keep your tension on that strand loose, or the blanket will bunch and pucker. Of course, you can also complete it with just one colour and avoid that issue entirely, but I love how the clusters stand out with a contrasting yarn. The size I've given here is to also fit a 24 week bub, so it matches the sizes of the hat and gown, but it's very easy to increase (or decrease if you want it smaller), and once you've done a few rounds you'll see how. 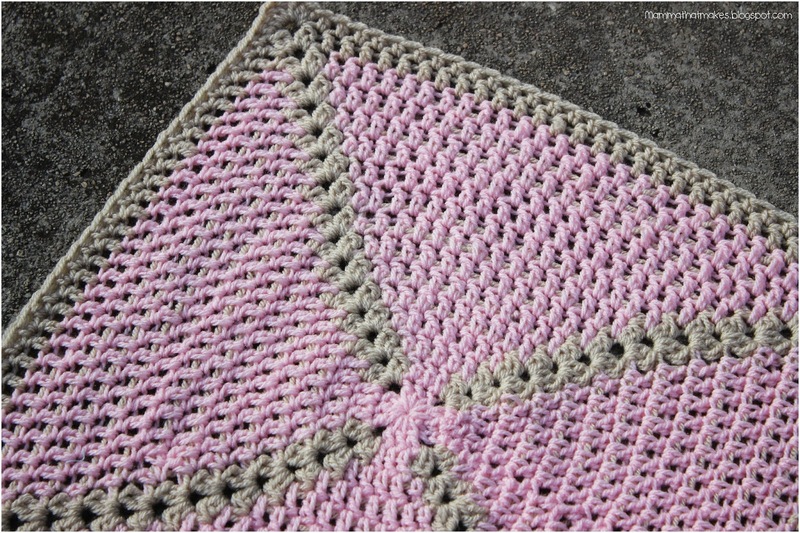 You could also make multiple small ones, and join them together for a much larger cot/bed sized blanket. If you are confident with chainless dc starts you can use that in place of the starting ch3 throughout. 1: Ch5, join to make a ring (or make a magic ring), ch3 (counts as first dc here and throughout), into the ring do 2dc, ch2, 3dc, ch2, 3dc, ch2, 3dc, ch2, join to the starting chain. 2: Ch3, dc in the next 2 stitches, (cl, ch2, cl) in the next ch2 space in alternate colour, *With main colour dc in the next 3 stitches, (cl, ch2, cl) in the next ch2 space in alternate colour*, repeat around, join to the starting chain. 3: Ch3, dc in the next 4 stitches, (cl, ch2, cl) in the next ch2 space in alternate colour, *With main colour dc in the next 5 stitches, (cl, ch2, cl) in the next ch2 space in alternate colour*, repeat twice, dc in the last stitch with main colour, join to the starting chain. 4: Ch3, dc in the next 4 stitches, (cl, ch2, cl) in the next ch2 space in alternate colour, *With main colour dc in the next 7 stitches, (cl, ch2, cl) in the next ch2 space in alternate colour*, repeat twice, dc in the last stitch 2 stitches with main colour, join to the starting chain. 5: Ch3, dc in the next 5 stitches, (cl, ch2, cl) in the next ch2 space in alternate colour, *With main colour dc in the next 9 stitches, (cl, ch2, cl) in the next ch2 space in alternate colour*, repeat twice, dc in the last stitch 3 stitches with main colour, join to the starting chain. 6: Ch3, dc in the next 6 stitches, (cl, ch2, cl) in the next ch2 space in alternate colour, *With main colour dc in the next 11 stitches, (cl, ch2, cl) in the next ch2 space in alternate colour*, repeat twice, dc in the last stitch 4 stitches with main colour, join to the starting chain. 7: Ch3, dc in the next 7 stitches, (cl, ch2, cl) in the next ch2 space in alternate colour, *With main colour dc in the next 13 stitches, (cl, ch2, cl) in the next ch2 space in alternate colour*, repeat twice, dc in the last stitch 5 stitches with main colour, join to the starting chain. 8: Ch3, dc in the next 8 stitches, (cl, ch2, cl) in the next ch2 space in alternate colour, *With main colour dc in the next 15 stitches, (cl, ch2, cl) in the next ch2 space in alternate colour*, repeat twice, dc in the last stitch 6 stitches with main colour, join to the starting chain. 9: Ch3, dc in the next 9 stitches, (cl, ch2, cl) in the next ch2 space in alternate colour, *With main colour dc in the next 17 stitches, (cl, ch2, cl) in the next ch2 space in alternate colour*, repeat twice, dc in the last stitch 7 stitches with main colour, join to the starting chain. 10: Ch3, dc in the next 10 stitches, (cl, ch2, cl) in the next ch2 space in alternate colour, *With main colour dc in the next 19 stitches, (cl, ch2, cl) in the next ch2 space in alternate colour*, repeat twice, dc in the last stitch 8 stitches with main colour, join to the starting chain. 11: Ch3, dc in the next 11 stitches, (cl, ch2, cl) in the next ch2 space in alternate colour, *With main colour dc in the next 21 stitches, (cl, ch2, cl) in the next ch2 space in alternate colour*, repeat twice, dc in the last stitch 9 stitches with main colour, join to the starting chain. 12: Ch3, dc in the next 12 stitches, (cl, ch2, cl) in the next ch2 space in alternate colour, *With main colour dc in the next 23 stitches, (cl, ch2, cl) in the next ch2 space in alternate colour*, repeat twice, dc in the last stitch 10 stitches with main colour, join to the starting chain. 13: Ch3, dc in the next 13 stitches, (cl, ch2, cl) in the next ch2 space in alternate colour, *With main colour dc in the next 25 stitches, (cl, ch2, cl) in the next ch2 space in alternate colour*, repeat twice, dc in the last stitch 11 stitches with main colour, join to the starting chain. 14: Ch3, dc in the next 14 stitches, (cl, ch2, cl) in the next ch2 space in alternate colour, *With main colour dc in the next 27 stitches, (cl, ch2, cl) in the next ch2 space in alternate colour*, repeat twice, dc in the last stitch 12 stitches with main colour, join to the starting chain (join with contrasting colour). 15: Complete this round using only the contrasting colour. Ch3, dc in the next 15 stitches, (cl, ch2, cl) in the next ch2 space *dc in the next 29 stitches, (cl, ch2, cl) in the next ch2 space *, repeat twice, dc in the last stitch 13 stitches, join to the starting chain. 16: Continue with contrasting colour. Ch2, hdc in the first 16 stitches, (3hdc, ch2, 3hdc) in the next ch2, *hdc in the next 31 stitches, (3hdc, ch2, 3hdc) in the next ch2*, repeat twice, hdc in the last 14 stitches, join to the starting chain. Alternative edge ideas: You could easily add a second round for a thicker edge, or even reverse sc (ch2 in each corner) after round 16. 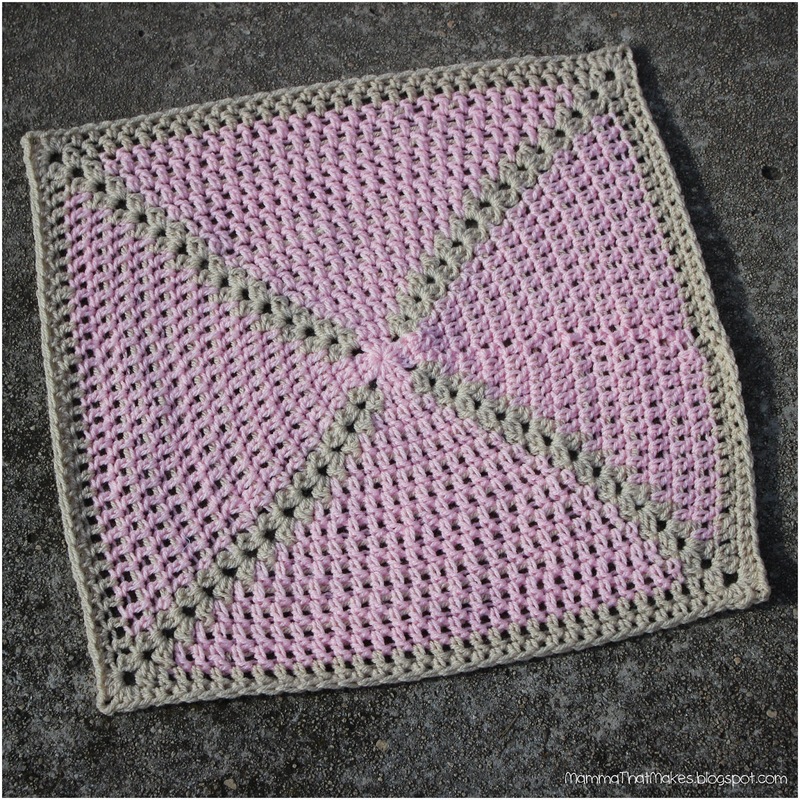 For a more feminine blanket try a picot edge after round 16. 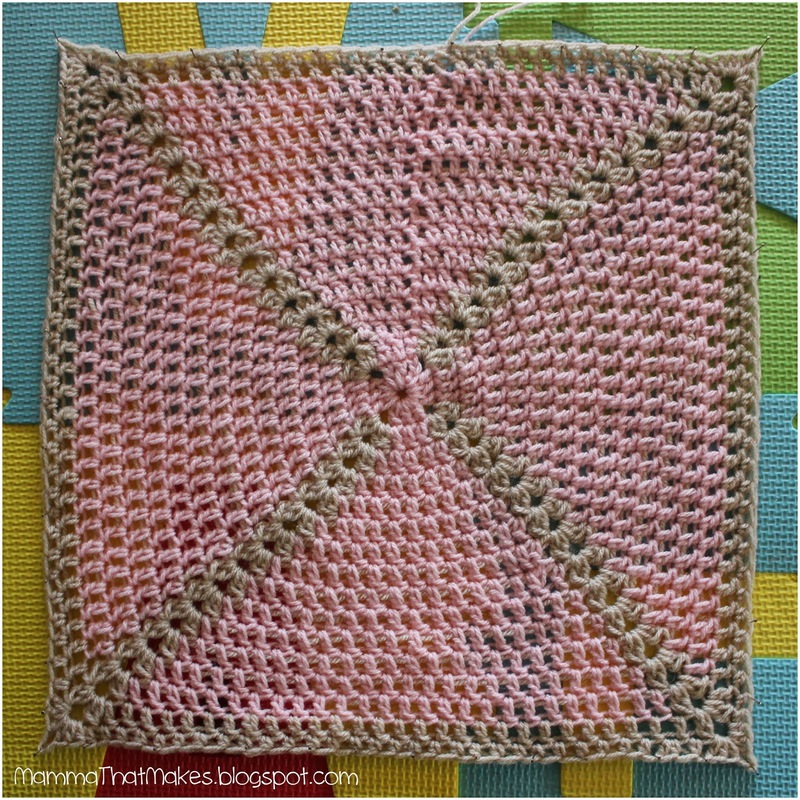 Blocking: It is best to block this blanket. I use acrylic yarn, so I went block by getting the blanket damp, and pinning it out on some old foam letter mats.